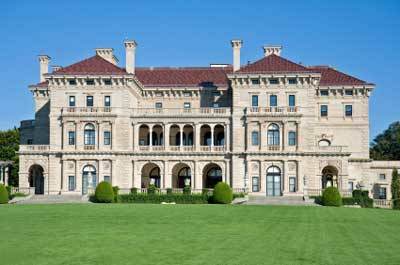 Newport Rhode Island Mansions – See how the elite lived during the Gilded Age! See how the elite lived during the Gilded Age! 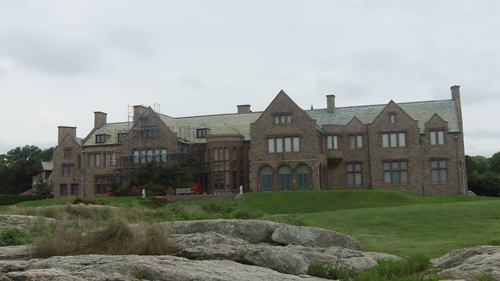 The Newport Rhode Island mansions are the Ocean State's #1 tourist attraction for a reason. Check out the video and photos below to see how America's wealthiest families lived during the Gilded Age. If you're wondering if this is one of the Newport mansions you've seen depicted in a movie, the answer is yes. This amazing summer residence, designed by Richard Morris Hunt (who also designed The Breakers and Marble House), can be seen in the Hollywood blockbuster, True Lies. In the opening scene of the movie, the exterior of Ochre Court is used for the Swiss chateau that Arnold Schwarzenegger must infiltrate. Many of the interior shots (including the famous tango scene) were taken down the street, at Rosecliff. The Breakers mansion is the crown jewel of Newport Rhode Island mansions. It was the first mansion I saw growing up, and is the most popular attraction in the entire state of Rhode Island (300,000 visitors annually). The Breakers is tucked away on Ochre Point Avenue, just a short distance from most of the other Newport mansions on Bellevue Avenue. 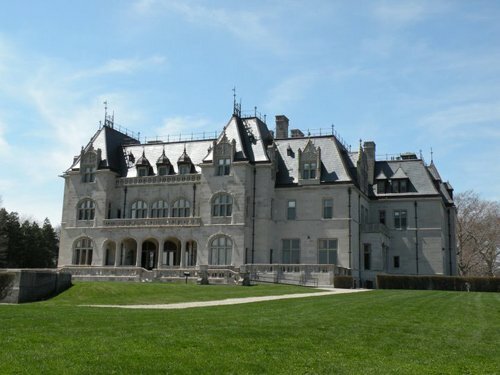 It is less than half a mile from Ochre Court, another mansion that is now part of Salve Regina University. Built in just two years (1893-1895) at a cost of over 7 million dollars (equivalent to over $150 million today), this National Historic Landmark was the summer home of Cornelius Vanderbilt II. The Breakers is open daily year-round, except for Thanksgiving and Christmas Day. Duke passed away in 1993, and after some legal issues were sorted out, the property was opened to the public in 2000. I was lucky enough to see it at that time when I worked a small event that was held there for the opening. Located at the southeastern end of Bellevue Avenue, Rough Point overlooks Newport's beautiful rocky coastline and can be seen from the scenic Newport Cliff Walk. This Newport Rhode Island mansion was commissioned in 1887 for Frederick W. Vanderbilt, the sixth son of William H. Vanderbilt. Vanderbilt sold the property to William B. Leeds in 1906, and Leeds' widow sold it to James B. Duke (benefactor of Duke University) in 1922. Just one year after completing renovations in 1924, Duke passed away. He left the home and his fortune ($100 million) to his 12 year old daughter Doris Duke. Doris continued to use the home up until her death in 1993 at the age of 80. I hope you enjoyed our short video and photos. To see and learn more about the rest of the Newport Rhode Island mansions, visit our main Newport Mansions page.